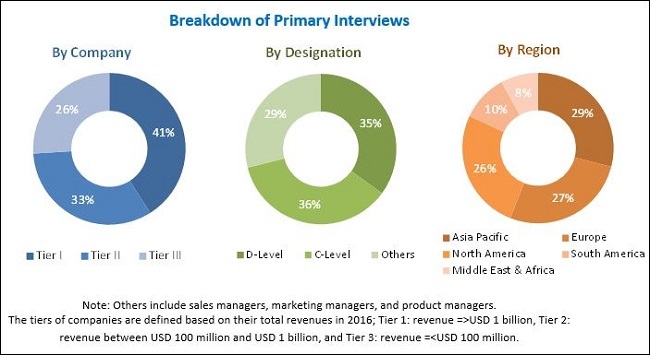 [151 Pages Report] elastic adhesive market was valued at USD 13.62 Billion in 2016 and is projected to reach USD 20.07 Billion by 2022, at a CAGR of 6.68% during the forecast period from 2017 to 2022. The scope of the report includes elastic bonding adhesives and sealants. The base year considered for the study is 2016 and the forecast period is from 2017 to 2022. Both, top-down and bottom-up approaches were used to estimate and validate the size of the elastic adhesive market and estimate the size of various other dependent submarkets. The research study involved extensive use of secondary sources, directories, and databases such as Hoovers, Bloomberg, Chemical Weekly, Factiva, Independent Chemical Information Service (ICIS), and the Securities and Exchange Commission (SEC), among other government and private websites to identify and collect information useful for this technical, market-oriented, and commercial study of the elastic adhesive market. The elastic adhesive market has a diversified and established ecosystem of upstream players such as raw material suppliers, and downstream stakeholders such as manufacturers, vendors, end users, and government organizations. The key players operating in the elastic adhesive market include Henkel (Germany), 3M (US), Arkema (France), Weicon (Germany), Wacker Chemie (Germany), and Sika (Switzerland), among others. The elastic adhesive market has been covered in detail in this report. Current market demand for elastic adhesives and forecasts have also been included in this report to provide a comprehensive scenario of the elastic adhesive market. Increasing demand for elastic adhesives across various end-use industries is driving the growth of the elastic adhesive market. The elastic adhesive market is projected to grow from USD 14.53 Billion in 2017 to USD 20.07 Billion by 2022, at a CAGR of 6.68% between 2017 and 2022. The scope of the report includes elastic bonding adhesives and sealants. Elastic adhesives provide improved aesthetics to windows and consumer durables. These adhesives are also used for glazing as they limit the use of screws, nails, fillet bonders, and lightweight fittings. They have compatibility with metal surfaces, painted surfaces, all absorbent mineral substrates, wood, brickwork, and glass, among others. They can be painted after complete polymerization as well. The polyurethane segment is projected to lead the elastic adhesive market during the forecast period. The Silane Modified Polymers (SMP) segment of the elastic adhesive market is projected to grow at the highest CAGR between 2017 and 2022. Polyurethane resin types are mainly used for bonding windscreens and side and rear windows of passenger cars, trucks, tractors, and special vehicles, among others as they offer improved adhesion and painting characteristics. Silicone resin types exhibit high chemical stability against external agents such as oxygen and ultraviolet light and hence, are used for joints and sealed glass in windows, doors, and solar panels. The construction end-use industry segment of the elastic adhesive market accounted for the largest share of the elastic adhesive market in 2016. Elastic adhesives provide strong bonding and excellent stress recovery to substrates, thereby enabling them to retain shape after being pulled or bent. They have fast-curing rates and adhere to non-primed surfaces. Elastic adhesives protect surfaces against impacts, shocks, abrasion, and aging. Using the latest computer technologies, manufacturers can design elastic adhesive joints of different dimensions to cater to the requirements of applications with precisely determined limits. They also enable improved designs with enhanced aesthetics and painting characteristics. The Asia Pacific region is the largest market for elastic adhesives across the globe. The Asia Pacific elastic adhesive market has grown over the past few years due to the rising income level of the middle-class population and increasing government investments, especially in the building & construction sector of the region. The Asia Pacific region is increasingly becoming an important global trade and commerce center. The region is currently the fastest-growing and the largest market for elastic adhesives in the world. With the economic contraction and saturation of the European and North American markets, manufacturers are shifting their bases towards the Asia Pacific region. 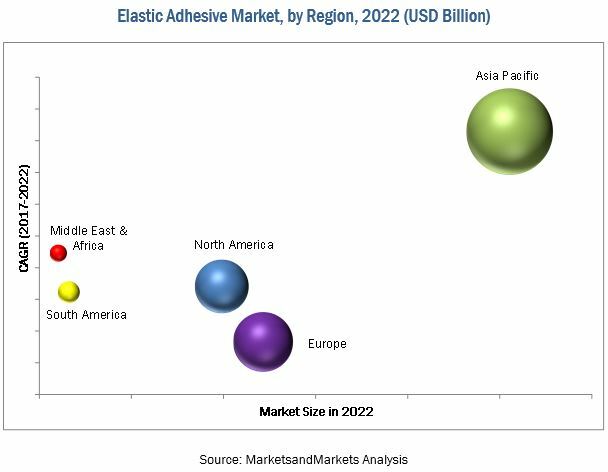 However, the lack of awareness among end users about benefits offered by elastic adhesives is expected to restrain the growth of the elastic adhesive market during the forecast period. The key manufacturers of elastic adhesives include Henkel (Germany), 3M (US), Arkema (France), Weicon (Germany), Wacker Chemie (Germany), and Sika (Switzerland), among others.